We already have seen how Windows Azure connect can help us in connecting our windows azure role instances to our local computers in the previous post. We also saw in the use cases/scenarios for azure connect, that we can domain join our windows azure roles with our on-premise Active Directory, and this is possible by using connect plug-in. You can now control access to your azure role instances based on domain accounts. You can now provide access control using windows authentication along with on-premise SQL server. In general, as customers migrate existing Line of Business applications to cloud; many of those applications today are written or assume domain joined environment. And with this capability of domain joining your azure roles to on-premise AD, this process of migration can be made simpler. Enable one of your domain controller/DNS servers for connectivity by installing Windows Azure Connect Agent on that machine. Many customers with multiple Domain Controller environment, will have many DCs. For such scenario it is recommended to create a dedicated AD site to be used for domain joining of your azure roles. - you can specify list of domain users or groups that will automatically be added to local admin groups for your azure role. Configure your network policy. This will specify which roles will connect to what Active Directory servers. This is done from admin portal. Building applications for cloud and hosting them on cloud is one of the great things that happened in recent times. However, you might be having number of existing applications that you wish to migrate to cloud, but you do not want to move your database server to the cloud. Or you want to create a new application and host it in the cloud, but this new application needs to communicate with your existing on-premise applications hosted in your enterprise's network. Other case might be that your new application that you wish to host in cloud will rely for its authentication on your enterprise's Active Directory. What options do you have? You can think of re-writing your on-premise applications for azure and then host them in azure, or in case of Database servers, you can move your DB servers to SQL Azure in cloud. But you have other easier option too, that has been announced in PDC10 and which will be released by the end of this year. What we are talking about is Windows Azure Connect. Later in this post we will talk about How to setup windows azure connect and Azure Connect Use Cases & Scenarios. But first let's go through what connect is and why do we need it. Windows Azure Connect provides secure network connectivity between your on-premises environments and Windows Azure through standard IP protocols such as TCP and UDP. Connect provides IP-level connectivity between a Windows Azure application and machines running outside the Microsoft cloud. This combination can be of different scenarios, which we will see later in the section of Use Case and Scenarios. In first CTP release we can access Azure resources by installing connect agent on the non-azure resources. The upcoming release will support Windows Server 2008 R2, Windows Server 2008, Windows 7, Windows Vista SP1, and up. A point to be noted here is that this isn’t a full-fledged virtual private network (VPN). However, future plans are to extend current functionality which will enable connectivity using your already existing on premise VPN devices that you use within your organization today. 1. Enable Windows Azure Roles for external connectivity. This is done using service model. 2. Enable your on-premise/local computers for connectivity by installing windows azure connect agent. 3. Manage Network Policy through Windows Azure Portal. Final step is to configure and define network policy. 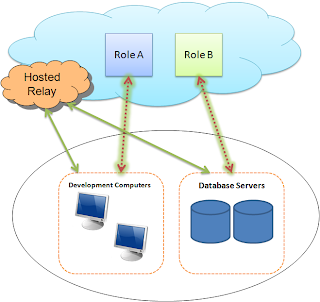 This defines which WA roles and local computers that you have enabled for connect are able to communicate with each other. This is done using WA admin portal. It provides very granular level of control. To use Connect with a Windows Azure service, we need to enable one or more of its Roles. These roles can be Web/worker role or a new role Vm Role announced at PDC10. For web/worker role, the only thing we need to do is to add an entry in your .csdef. You simply add a line of xml in your .csdef specifying to import or include windows connect plugin. Then, you need to specify your ActivationToken in ServiceConfiguration (.cscfg) file. ActivationToken is a unique per-subscription token, which means if you have two different Azure subscriptions then you will have individual Activation Token for each subscription. This token is direclty accessed from Admin UI. For VM role, install the Connect Agent in VHD image using the Connect VM install package. This package is available through Windows Azure Admin Portal and it contains the ActivationToken within itself. Also, in our .cscfg file you can specify optional settings for managing AD domain-join and service availability. Once these configuration are done for a role, connect agent will automatically be deployed for each new role instance that starts up. This means, if tomorrow, for example, you add more instances to the roles then each new instances will automatilcally be provisioned to use Azure Connect. 1. Web-based installation: From your Windows Azure Admin portal you get a web-based installation link. This link is per-subscription basis and it has the activation token embedded within the URL. 2. Standalone install package: Other option you have is to use standalone installation package. You can run this installation package using any standard software distribution tool installed in your system, as you do it for other programs. It will add activation token into registry and read its value from there. Once Connect agent is installed, you will also have a client UI on your system as well as connect agent tray icon in your system tray. Connect agent tray icon & client UI let you view the current status, both the activation status as well as network connectivity status, of azure connect agent. Also it provides basic tasks such as network refresh policy. Once you have identified your Azure Roles that need to connect to on-premise comouters, and also you have installed and actiated Connect Agents on your local computers, you need to configure which roles connect to which of the configured local computers. To do this we specify Network Policy and it is managed through Windows Azure admin portal. Again, this is done on a per-subscription basis. 1. You can take your local computers, that have been enabled and activated for Windows Azure Connect by installing connect agents on them, and organize them into groups. e.g. you might create a group that contain your SQL Server computers that one of your azure role needs to connect to, and call this "SQL Server Group". Or you might put all you developer laptops into My Laptops group or you might put computers related to a given project into a group. However, there are two constraints - first, a computer can only belong to a single group at a time and second, when you have a new computer where you just installed Windows Azure Connect agent on, the newly activated computer is unassigned by default meaning it doesn’t belong to any group, and therefore they wont have connectivity. As shown in the Figure 2 above, we can have groups of local Development machines, and call this group “Development Computers” and our Windows Azure Role – “Role A” will connect to this group. Similarly, we can have a group of our DB servers and name this group as “Database Servers” and have our Role B connect to this group. All these configurations will be done from Azure Admin Portal. 2. Windows Azure roles can be connected to the group of these local computers from admin UI. It is done for all of the instances that make up that azure role and all the local computers in that group. One thing to note is that WINDOWS AZURE CONNECT DOES NOT CONTROL CONNECTIVITY WITHIN AZURE. In other words you can’t use WA connect to connect between two roles which are part of a service or two instances that are part of the same role. The reason for this there are already existing mechanisms for doing this. WA connect is all about connecting azure roles to computers outside of azure. 3. Additionally, it has the ability of connecting group of local computers to other groups of local computers. This enables network connectivity between computers in each of these groups. Additionally, we can have interconnectivity for a given group. This allows all computers within that group to have connectivity with each other. This functionality is useful in ad-hoc or roaming scenarios e.g. if you like to have your developer laptop to have a secure connectivity back to a server that resides in your corporate network. Once you have defined network policy , Azure connect service will automatically setup secure IP level network connection between all of those role instances that you enabled for connectivity and local computers, based upon the network policy you specified. All of the traffic is tunneled through Hosted relay service. This ensures Windows Azure Connect will allow you to connect to resources regardless of firewalls and NAT configuration of the environment they are residing in. Your Azure Role Instances and your local computers, all will have, through WA Connect, secure IP level connectivity. This connectivity holder is established regardless of the physical network topology of those resources. Due to any firewalls or NATS, many local computers might not have direct public IP addresses. But using Windows Azure Connect you can establish connectivity through all of those firewalls and NATs, as long as those machines have outbound HTTPS access to the hosted relay service. Figure 2 above shows how local on-premise computers are connected to web role instances through Hosted Relay Service. Other point to note here is that network connectivity that Windows Azure Connect establishes is secured fully in an end to end fashion using IPSec, and Azure Connect agent takes care of setting this up automatically. Each connected machine has a routable IPv6 address. Important point to note is even being part of Windows Azure Connect network, any of your existing network behavior remains unchanged. Connect doesn't alter the behavior of you existing network configuration. It just joins you to an additional network with connect. Once the network connectivity is established, applications running either in azure or on local system will be able to resolve the names to IP address using DNS name resolutions that connect provides. 1. Enterprise app migrated to Windows Azure that requires access to on-premise SQL Server. This is most widely seen scenario. You have your on-premise application which connects to your on-premise database server. Now you are willing to move your application to Azure, but due to some business reasons the database this application uses needs to stay on premises. Using Windows Azure connect, the web role, converted from on-premise ASP.NET application, can access the on-premises database directly. The wonderful thing here is that it does not even require to change the connection string, as both web-role and database server are in the same network. 2. Domain-joined to the on-premises environment. This scenario opens up various other use cases. One such case is letting the application use existing Active Directory accounts and groups for access control to your Azure application. Theefore, you should not be bothered about exposing your AD to internet to provide access control in cloud. Using Windows Azure Connect your azure services/apps are domain joined with your Active Directory domain. This enables to control who can access azure services based on your existing windows user or group accounts. Also, domain-joining allows single sign-on to the cloud application by on-premises users, or it can allow your azure services to connect to on-premise SQL server using Windows Integrated Authentication. We will see in a seperate post How to Domain Join Azure Roles with Active Directory using Connect.